Nougatine, crystallized orange peel, coffee, ginger, aniseed, cardamom, cinnamon, nutmeg, cumin, and Earl Grey Tea. Dolfin: Add Some Spice to Your Life! The Dolfin Company was founded in 1989 by Michael and Jean-Francois Poncelet, brothers who can attribute their infatuation and experience with chocolate to fortuitous parentage. They were born into the great Belgian tradition of chocolate making. 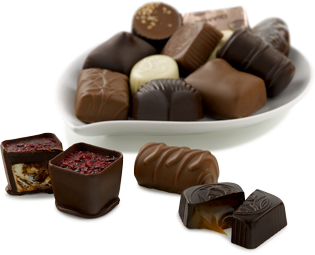 Their mother and father once owned Neuhaus, a world-renowned Belgian master-chocolatier enterprise. Their heritage and exposure instilled in the brothers a passion for chocolate and a desire to master the art of exceptional chocolate making. They knew firsthand the intoxication that excellent chocolate can have on the senses. At the same time, they gained experience and exposure to the time-tested methods and ingredients used to produce world-class chocolate. When the Poncelet brothers decided to create their own company, they weren't interested in exploiting their chocolate-making legacy to make a quick buck. Their goal was to create confections that would be respected and coveted worldwide. The components of Dolfin chocolates are a far cry from flavored creams and artificial fillings. Their entire product line is based on choosing and mixing unique and natural ingredients with the highest quality chocolate. Their top-shelf bars and Neapolitan chocolate squares are offered in some of the most prestigious emporiums in the world—Selfridges in London, La Grande Epicerie in Paris, the KDW in Berlin, and the Sony Plaza in Tokyo, among others. This month you are in the company of fellow chocolate lovers in every corner of the globe. Over the last decade the company’s growth has been as impressive, a testament to their chocolate making skills. Meeting with critical as well as public acclaim, Dolfin has been awarded the Imagination and Creativity Prize at the Sial in Paris—the annual event in the food industry—as well as gold and silver medals in the Great Taste Awards held in London. Among the most sought-after offerings in their collection are the remarkably flavorful Neapolitans. A tempting invitation to overindulge, the square Neapolitan provides the perfect bite of pleasure, and one that can, thankfully, be repeated often! 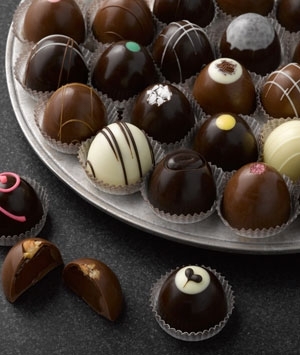 With thirteen delicious flavors in two packages—we're talking no fewer than 96 pieces of gourmet chocolate! The master chocolatiers of Dolfin are focused on cultivating the intense and aromatic flavors of authentic Belgian chocolate: robust and often intense in the case of their dark chocolates; tender and soft in the case of their milk chocolates. As world travelers, they’re interested in the wide range of flavors offered across the globe – flavors which can still be found and enjoyed in their unrefined, natural and authentic state. Spices, herbs, fruits and flowers are blended with chocolate in creative ways that are sometimes surprising, but always in harmony. However, the actual ingredients, while critical, are not the only important issue when it comes to the overall tasting experience. How the ingredients are incorporated is key. Should they be ground, grated, or crushed? This new meticulous approach devoted to ingredient selection and blending results in a complex mouth-watering experience, which can be characterized as "a procession of flavors”—similar to the way one would taste wine. First you taste the chocolate. Then it melts, allowing the essence of the other components—a sharp or mild spice, for example—to be revealed in all their purity and complexity. The end result is a product that can be enjoyed on many levels. These chocolates are sublime to taste, a pleasure to smell, and lovely to look at. Milk Chocolate: Plain and simple? Not even close. While Dolfin's more intricate flavor pairings may garner more attention at first, this milk chocolate Neapolitan is about as flavorfully ornate as milk chocolate comes. The true essence of the superbly popular cocoa and milk combination is revealed in this smooth and sultry example of chocolate perfection. Relish it! Dark Chocolate with Nougatine: The nougatine created by the artisans at Dolfin is unlike anything you have ever tasted. Countless incarnations using literally hundreds of varied blends were experimented with before finally achieving the flavorsome combination found in this ambrosial confection. Note the aroma that hits the nose first, highlighted by a nutty, almost buttery, quality. The initial flavor is of dark chocolate, with the bulk of the nougatine flavors being released only after the chocolate begins to melt in your mouth. It is a virtual pageant of scents and flavors. Milk Chocolate with Nougatine: Sultry smooth milk chocolate blended with a rich cascade of nougatine flavors awaits you inside this deliciously delicate Neapolitan square. Truly delicious, but be sure to take your time with these (and all of the other) chocolate pieces. Sample it, bite by bite, and experience bliss as each morsel melts slowly in your mouth. Dark Chocolate with Orange Peel: This isn't your ordinary orange-infused chocolate square. The folks at Dolfin are not content to use some artificial orangey flavor or even a genuine orange oil concentrate. This chocolate actually contains tiny pieces of crystallized orange peel, imparting a sweet yet slightly bitter flavor that sings in perfect harmony with the chorus of dark chocolate flavors. Yummy! Milk Chocolate with Coffee: In addition to the quality of the coffee used, the milling of the beans provides the flavor keystone for this chocolate. The milling is fine enough to avoid large, cumbersome bits on the palate, but not so fine as to underwhelm the senses. With this carefully-achieved blend, the coffee taste is carefully spread out and not overpowered by the sweetness of the chocolate. Note the tiny chips of crystallized coffee bean as you enjoy this treat! Dark Chocolate—70% Cocoa: Cocoa lovers, be prepared for a real indulgence. At 70% cocoa, this chocolate is a truly decadent extravagance. At these levels of cocoa content, the fun qualities of dark chocolate are revealed. As you likely are aware, what most mass-produced "chocolates" taste like has very little to do with authentic cocoa flavor. Thankfully, Dolfin chocolates provide genuine cocoa flavor to those who are lucky enough to indulge. Dark Chocolate—88% Cocoa: Prepared for a cocoa overload? No such thing, we say. For the true chocolate lover, this exceptional example of dark chocolate with its astonishing 88% cocoa will wow you. It still manages to be remarkably palatable with a bittersweet character. Enjoy this piece of heaven when you're not in a rush. This is chocolate that must be savored. Enjoy it during a quiet moment with either a glass of very cold, dry white wine, or with a cup of full-bodied, black coffee. When eaten with the wine, the sharpness of the chocolate will come through ahead of the sweetness. With the coffee, you'll taste the sweetness first. These sorts of pairings are wonderful ways to turn your chocolate cravings into moments of cocoa refinement. Dark Chocolate (52% Cocoa) with Fresh Ginger: This is one of the most unique flavors we've encountered in our chocolate-searching adventures. Ginger, regarded as the spice of life, comes together brilliantly in this sumptuous chocolate bar. It awakens the taste buds and is a great bar to cleanse the palate between deep dark chocolate flavors. Dark Chocolate (52% Cocoa) with Aniseed: Another example of Dolfin’s skill at pairing fabulous Belgian chocolate with unique and unusual spices in order to add a little zest and provide the taster with a complex flavor mix. Enjoy the flavorful dashes of licorice and dark, mildly bitter, chocolate in this interesting and tasty treat! Dark Chocolate (52% Cocoa) with Cardamom: Another Indian-spiced chocolate, expect characteristic cardamom notes of warm, lemony flavor. This is one you might want to keep around for Christmas time, as it makes a great holiday treat! From Scandinavia to India, this versatile spice is coveted in culinary delights the world over. Milk Chocolate with Cinnamon: Cinnamon and milk chocolate? Not the most common of pairings, but it is often the uncommon that yield unique delights. This Neapolitan is a splendid example of this philosophy. The cinnamon has been perfectly powdered and ground to achieve a subtle flavor one doesn’t experience fully until the chocolate melts in the mouth. Try this piece with coffee spiced with nutmeg and light whipped cream. (Not too sweet a cream which will overpower the flavor of the chocolate.) Or, enjoy it with a slice of the seasonally available favorite, pumpkin pie. Dark Chocolate with Cumin: "Excuse me?" You might be a bit stunned at the suggestion that cumin and dark chocolate belong together but try this and be convinced! The cumin flavors are restrained, allowing the dark chocolate to shine through, but with gentle spiciness and Far East flavorings. Another unique offering! Dark Chocolate with Earl Grey Tea: Many companies have begun infusing their chocolates with tea, often with the incomparable Earl Grey. This Neapolitan contains fine bits of tea leaves, imparting a wonderfully flavorful, aromatic, slightly spicy quality that must be tasted to appreciate. So what are you waiting for? This chocolate is wonderful alongside a fresh cup of Earl Grey, steeped for 3-5 minutes and taken straight (cream or sweeteners can interfere with the true tea flavors). We know you will enjoy these chocolates born of two brothers’ passion for chocolate and their exceptional chocolate-making acumen!